The event will be showcasing the many schools and colleges we have here in Thurrock and our aim is to recruit the best for Thurrock pupils. This recruitment event is for all returning teachers, newly qualified teachers, graduates who are looking to get into teaching and for young people who are interested in the apprenticeship route into teaching. If you know someone who may be interested in attending, please pass on the date and don’t forget to tell them; there is a free prize draw for those attending on the day! Visit http://www.teachinginthurrock.co.uk to register your attendance and find out more. 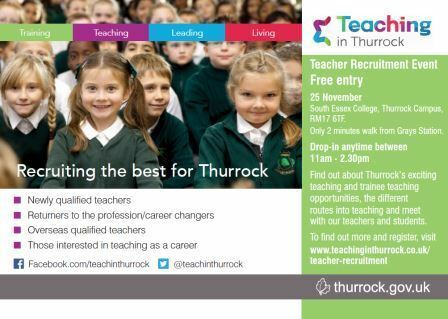 Follow us on Twitter @TeachinThurrock or on Facebook (search Teaching in Thurrock) to keep up to date with event news.